A key methodology I use is No BS Mentoring. Find out more about my mentoring here. In my mentoring I have encountered 3 massive mistakes even the best leaders are making. Finding shared-view means everyone respecting each others views and being big enough to let go of yours and/or mine and discover ours. Once we have found ours and by definition defined boundaries, we need to let people loose. Allowing and enabling people to be responsible for the moments of truth in the customer/client experience is a key. A long time ago people at Proctor & Gamble identified moments of truth in the customer experience, FMOT (first moment of truth) is just before the customer buys and SMOT (second moment of truth) is when the customer first begins to experience what they have bought. In 2011 Google identified ZMOT (zero moment of truth) the crucial moment that happens before we buy. I recommend downloading Jim Lecinski’s ebook and other resources. 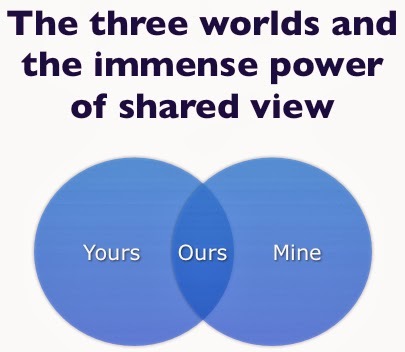 In The End of Business As Usual Brian Solis introduces UMOT (ultimate moment of truth) which is when customers share their experiences with others. All these moments of truth matter in business today. And there are many others. Are your employees truly empowered in all the interaction and transaction moments of truth of your business? If you would like help with any of the above please contact me on +61 418 807 898 to discuss a mentoring program just for you. Absolutely begin with the end in mind and then focus on the steps to get there. Do your policies, procedures, practices, and processes make it simple for your people to bring their very best to their work on a consistent basis? Do your policies, procedures, practices, and processes mean everyone in your supplier-customer chain is able to simply deliver value to whoever gets their work next in ways that others want that value delivered? If you answered Yes to both these questions congratulations. If you answered no or not always please contact me on +61 418 807 898 to discuss a mentoring program just for you. The diagram below illustrates what is happening every day in most organisations. Problem, performance drops, productivity suffers and not just where the problem happened, we solve the problem returning everything to normal. The tragedy in most instances is that we fail to innovate and take performance to a whole new level. And double tragedy often occurs too, we fail to remove what caused the problem in the first place because we have got used to just dealing with what happened and fixing it. Is every problem seen as an opportunity to innovate at your place? Are you solving problems and reinstating the status quo or are you innovating and taking performance to a whole new level? If you answered Yes to both these questions and the other questions in this article it is likely that you have a great business. Congratulations. If you answered no or not always please contact me on +61 418 807 898 to discuss a mentoring program just for you.